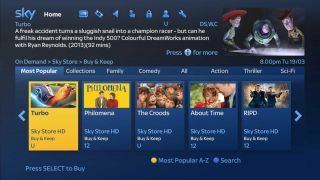 Sky has told TechRadar that it it is still planning to do Blu-ray as part of its Buy and Keep service, but its first task will to bring box sets from television and film to its service. Sky's Buy and Keep service has hit a fairly large landmark, announcing that you will now receive a DVD, a copy to watch on your set top box AND crucially a digital edition for phone, laptops and tablet when you buy a movie. For some technophiles the DVD part of this may be more of an issue - although the lion's share of the digital media market still sits with the older format rather than Blu-ray. But Director of Sky Store Nicola Bamford told TechRadar that things were progressing as planned and remained a part of the service's future. "Blu-ray has always been part of the roadmap and it continues to be so," she said. "We look to the mass-market and 87% of the physical movie sales are in DVD so that's where we have focused our attention." Bamford would not be drawn on whether we could expect to see the service arrive in 2015, with the next phase of development instead focused on the arrival of the likes of Game of Thrones box sets and groups of movies. But, despite reservations, the service has 'exceeded expectations' according to Bamford. "The level of support... in terms of marketing and assets from the movie industry have been incredible," she added.